I’m alive!! I have spent the last several days in bed with what I am guessing was the flu. Boy was it horrible, I honestly can’t remember the last time I’ve felt so sick. I considered writing a post about herbal remedies, but none were really Latin American influenced and the best cure for the flu is really just rest, nourshing yet simple foods, and proper hydration. I didn’t take anything except a few drops of eucalyptus oil in a hot bath and it cleared up on its own. While I was bed bound I spent some time thinking about my diet and health journey. There are a lot of things I can’t eat now and a lot of things I’ve had to limit because they irritate my gut (ex. coffee and spicy foods. So sad!). It often feels like I am re-learning to eat. At this point I can say it has mostly been a positive experience. I feel more in control, sleep better, and have more energy, but at times it seems very tricky and a little overwhelming. It becomes even trickier because I am a bit picky, on a limited budget, and am trying very hard to make ethical food choices. Quinoa at first glance seems to be the perfect food; it is high in protein, relatively affordable, and goes down nicely. For awhile it was a fairly regular part of my diet, but there is a huge catch to this super food. Vegetarians and vegans often say that they chose their diets because they are against cruelty which I can respect, but if that is the case then I think we have to examine what we are eating even more closely. Much of the foods and especially health foods we eat are imported from the “global south” which has a very long history of exploitation from Europe and the United States. When we eat these imported foods we do not know under what kinds of conditions they were grown, but can assume that there are often human right’s violations and environmental degradation involved (such as with cultivation of asparagus in Peru or bananas/avocados in the tropics). We really have to look at the consequences of our appetites on the rest of the world and quinoa is a perfect example. 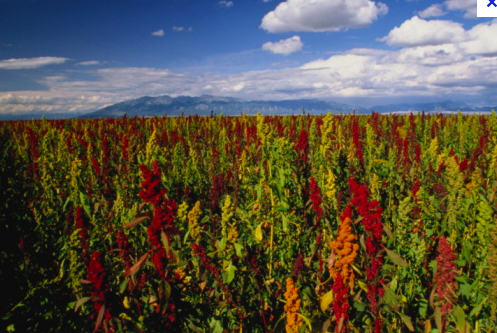 Since quinoa became trendy the cost of it world-wide has gone up. This means that fewer people in the Andes (where the crop originates) can afford it. This is troubling especially for a poor country like Bolivia where malnutrition is a serious issue. This ancient sacred grain is being replaced by cheap processed food a la USA which is a double whammy punch of colonization. First we drive their prices up and then we sell them cheap processed food, the result has been a dual nutritional burden of stunted growth and obesity. No wonder the USA is so beloved in Bolivia! I am not writing this post to make anyone feel guilty because I know how difficult eating has become. There are so many things to consider that it is hard not to have some sort of food hang-up. I’ve considered this issue for quite some time and am just really starting to address it. When I was in Ecuador this summer I asked one of our program directors who is Ecuadorian, but has lived in the USA for quite some time if she ate quinoa and what she thought about all this. She basically told me that it was complicated, but she felt you should eat the things your “people” were meant to eat. In her case that meant quinoa in mine… well..I’m still working on that.